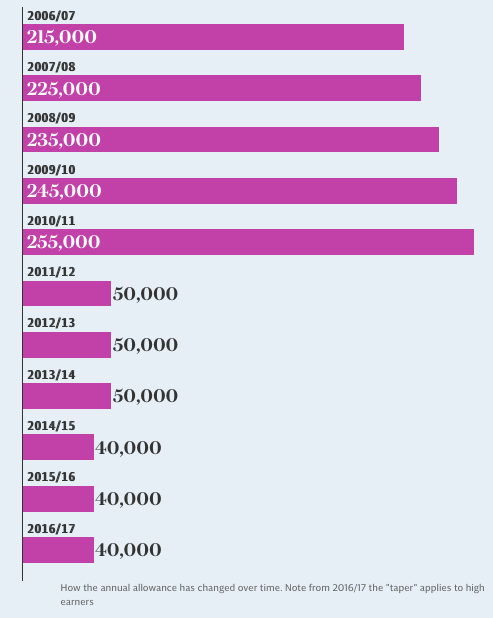 Home/Archive by Category "UK Pension Transfers"
QROPS continue to be a hobbyhorse for the UK government largely in a bid to fend off offshore pension scams. 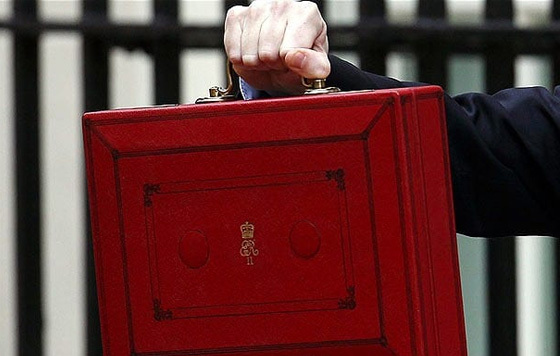 The UK Budget announced on 9th March 2017 made further changes impacting upon transfers of UK tax relieved pension funds to QROPS. Information on these changes and how they may impact you is outlined below. All UK pension transfers to offshore QROPS schemes will be subject to a 25% tax unless certain limited conditions are met including the requirement that both the individual and the scheme reside in the same country. Transfers to Australian superannuation schemes where you and the receiving scheme are both resident in Australia, and remain so for 5 clear UK tax years, are not affected. Effective 9 March 2017 (applies to all transfers made on or after 9 March 2017). Post transfer the receiving QROPS scheme and the individual reside in different countries within the EEA (an EU Member State, Norway, Iceland or Liechtenstein) i.e. The EEA will be considered a ‘single country’ for transfer purposes. The QROPS is a pension scheme established by an international organisation and the individual is employed by that international organisation. The QROPS control period increases to ten full UK tax years from your date of last UK residency. The receiving QROPS scheme is not in the same country as their country of residence. Example: To avoid a 25% HMRC tax all individuals residing within Australia who transfer their UK pension on or after 9 March 2017 must ensure the receiving QROPS scheme is also in Australia. Note: This does not apply if you and the receiving scheme reside within the EEA or you are transferring into an occupational scheme or overseas public service pension (refer 1. What was announced). All transfers received by a QROPS on or after 6 April 2017 will be subject to new tax provisions. Meaning, any payments you make out of the QROPS for 5 full UK tax years from the date of transfer will now be subject to tax. If an individual becomes resident in another country within 5 UK tax years of making their original tax free transfer, HMRC will treat this transfer as if the original exemption did not apply and your pension will be subject to the 25% tax. You reside in the same country as your QROPS transfer. You do not make any payments out of the receiving QROPS for 5 full UK tax years post the transfer (regardless of residency). You remain a resident in the same country as your QROP for 5 full UK tax years post the transfer. You and the receiving scheme reside within the EEA or you are transferring into an occupational scheme or overseas public service pension. The 25% tax will apply to the full transfer value. The 25% tax will be deducted by the scheme making the transfer and before the transfer is made. All Finsec PTX clients impacted by these changes have been contacted to ensure continued compliance. If you are not a client and have a UK pension please contact us to discuss your options or click here to receive further information regarding these changes. 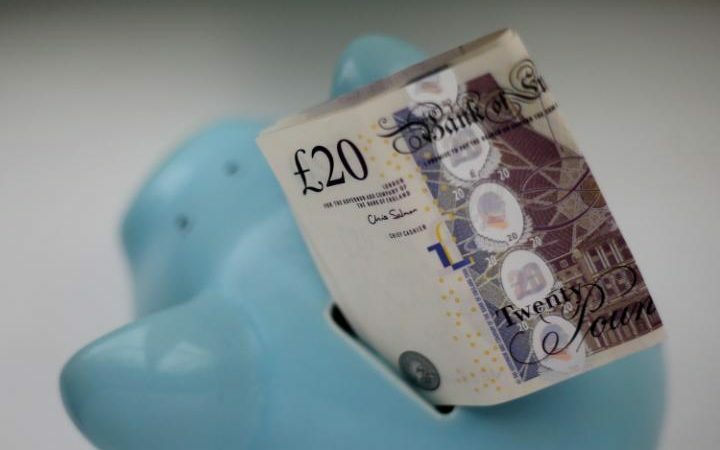 The amount you can save into a pension – once you have already taken some money out – has been slashed by the Government in a bid to clamp down on those seeking “double tax relief”. The move will hit hundreds of thousands of people, aged 55 and over, who have used the new “pension freedoms” available since April 2015 and taken cash from their pension pots. Philip Hammond said the “money purchase annual allowance” – the amount you can save into a pension in a year – will fall for people once they have accessed their savings. Currently people in this position – said to be “taking benefits” – can contribute £10,000 a year into a pension. They will obtain tax relief on these contributions at their highest income tax rate. But to close the loophole, the Chancellor will cut the amount that can be paid into pensions in these circumstances from £10,000 to £4,000 from April 2017. The Government will consult on the details. Before you access your private pension saving for the first time, your “annual allowance” permits up to £40,000 to be saved a year into pensions. The Government has left this limit unchanged. 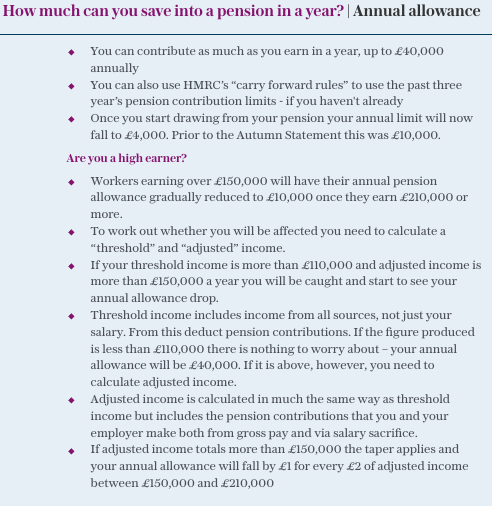 It has also left the “lifetime allowance” – the amount you can save into a pension in total – unchanged at £1m. The Government spend billions of pounds a year topping up pension contributions via tax relief. Tax relief is based on your income tax bracket, so higher earners receive more back from the state for every pound they save through a pension. In the first year of the pension freedoms, between April 2015 and April 2016, around 300,000 people made use of the new rules and accessed their pension pot in some way – the figure will be far higher by now. This could have been to buy an annuity, take a cash lump sum, or take some income and leave the rest invested. For those yet to begin drawing on their pension, they may still be caught by the new “taper” rule (see box, below). I’m caught by this – what should I do? If you have already triggered the money purchase annual allowance you should consider bringing forward any planned contributions, above £4,000, to before next April when the next limit will come in. However, explains Claire Trott, of Technical Connection, the tax specialists, there are some things you can do if you need to access your pensions . The lower annual allowance is only triggered when a pension is accessed “flexibly”. Crucially, this does not include taking tax free cash and leaving the rest of your money untouched or buying a flat or escalating annuity. If your provider allows it, you can also use the “small pots” rule – this allows you to take three separate pots worth less than £10,000 each and retain the full £40,000 allowance. Ms Trott also noted the lack of detail on what, if any, the changes mean for people with “defined benefit” pensions. Elsewhere, the Chancellor also pledged to keep the “triple lock” on the state pension in place. This measure protects the value of state pension payments from losing purchasing power. For UK Pension Transfers (into Australian Superannuation Schemes with QROPS status as at 5 April 2015) made between 6 April 2015 to 30 June 2015 (inclusive), HMRC has now confirmed such transfers WILL NOT be subject to any UK tax charges in relation to the transfer. For transfers made after 30 June 2015, no relief has been provided by HMRC in relation to any UK tax charges that may arise from the transfer. We will be in direct contact with any impacted clients to discuss the options and next steps and will keep you updated should any new information come to light. This is of course, the outcome we had been lobbying for since HMRC first announced the potential for penalties to be applied to UK transfers post 5 April 2015, however, we appreciate that the journey has been an uncertain and frustrating one. Although it has taken HMRC a long time to make a final ruling on this topic, we are relieved that fairness and common sense have prevailed. If you have previously worked in the UK, it is likely you hold a Government, Company or Personal Pension. 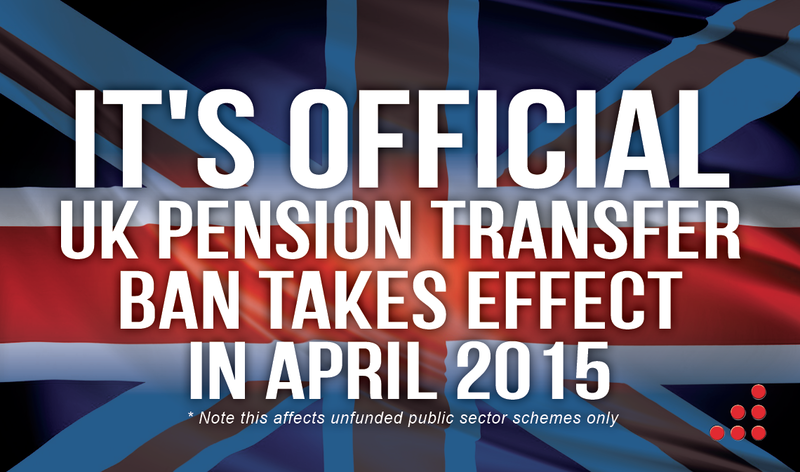 Radical UK reforms announced in March 2014 will prevent transfers of many of these pensions to Australia permanently. These changes take effect April 2015, leaving only a few months to take action. Public -sector employees with un-funded government final salary schemes will be affected by the ban. Less tax in retirement: If left in the UK, any income you receive from your Pension in retirement will be considered taxable income in Australia. If transferred to your Australian super fund, it may generate tax-free income. Greater flexibility & control: Untransferred Pensions remain susceptible to exchange rate fluctuations & further UK legislative changes over time. If transferred to your Australian super fund you have the opportunity to significantly grow this money. You can make decisions on how to best invest the dollars taking into consideration both market & personal influences. Death benefits: In the event of your death, in some instances your spouse may receive an ongoing percentage of your Pension left in the UK. In the event of their death, the payments stop altogether. If transferred to your Australian super fund, you have the opportunity to pass 100% of this money to your estate aswell as choosing who directly benefits from it. Transferring may or may not be of benefit to you, but there is only a limited window of opportunity to get the facts and make a decision. It is strongly recommended that anyone with a UK Pension seek advice from a professional transfer specialist immediately. Retirees and UK State Pensions are not eligible for transfers. On Wednesday 19th March the Chancellor of the Exchequer – George Osborne unveiled the most radical reformation of the UK pension regime, dwarfing the A-day changes announced in 2006. Changes, likely to be effective in April 2015, will ban transfers from public sector final salary schemes and may also be extended to include private sector final salary schemes. Transferring may or may not benefit for you, but you only have a limited window of opportunity to get the facts and make a decision. From April 2015 you will no longer have the option of transferring your pension to Australia – so don’t wait until it’s too late. To help you understand how these reforms will influence your situation we charge no upfront fees, giving you the information you need to make an informed decision without committing you to transfer or disturbing your UK benefits in any way. If you’d like to find out more about these reforms and your UK pension situation please call 1300 783 789 or visit this website. It’s A GOOD MOVE. Will UK sporting triumph translate to economic success? The UK seems to be on top of the world at the moment. But has all the sporting success and celebration translated into a more prosperous outlook for the troubled economy? Set the clock back five years and the UK is a country in crisis. The world’s second largest financial centre is in the midst of its worst crisis in decades, property prices are crumbling, the sharemarket has plunged 40% in less than 12 months and, for the first time in 150 years, there’s a run on one of its banks. Economic gloom descends on the nation1. Wind the clock forward to today and you see a very different picture. Wins in the Tour de France cycling, Wimbledon tennis, Ashes cricket and rugby have put a spring back in the step of the British. 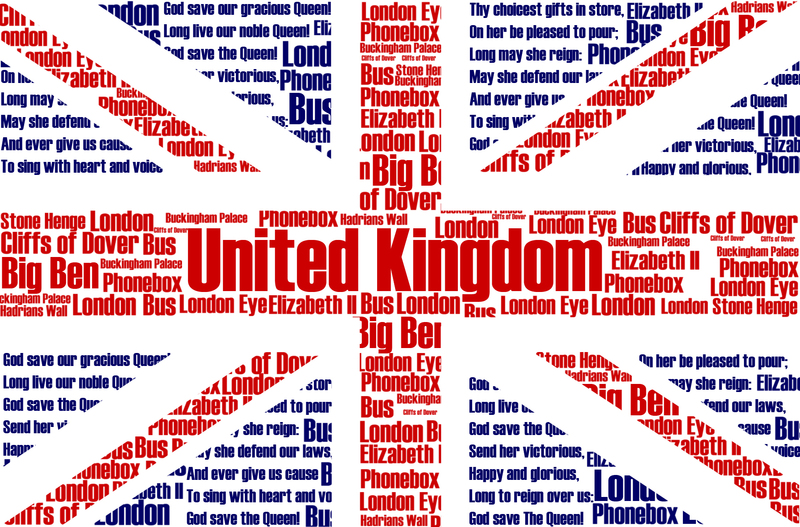 This positive energy and national pride has been further spurred by success on the world stage with the London Olympics and Queen’s Jubilee celebrations and a new addition to the much loved royal family. On the economic front, growth is starting to pick up. 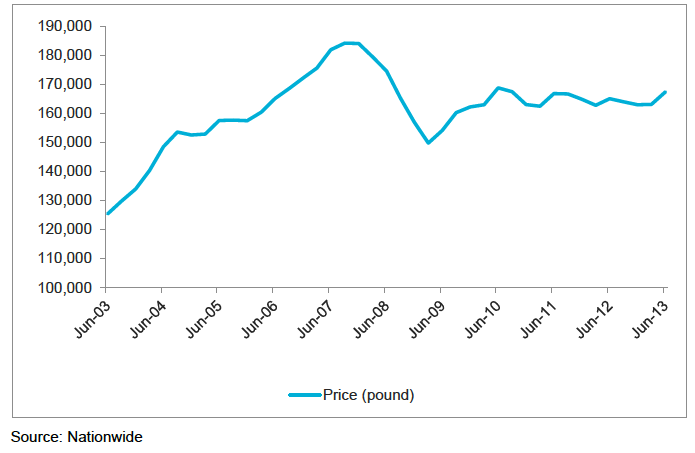 Property prices are on the rise, the pound is gathering strength (as you can see from Chart 1) and the sharemarket is approaching its all-time high. So is the UK economy out of the woods yet? Has it finally shrugged off the series of debt crises sweeping through its neighbours to the south and sorted out its own debt and structural issues? According to Advance Asset Management Economist Andrew Dowie, the UK economy is showing signs of improvement. 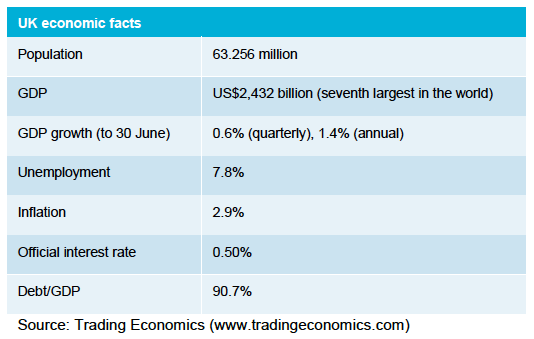 “There has been a lot of positive commentary around the most recent GDP data up 0.6% for the second quarter of 2013, bringing annual GDP growth to 1.4%, compared to 0% at the same time last year,” Mr Dowie says. But the picture is not all rosy. In February this year, credit ratings agency Moody’s downgraded the UK’s credit rating from AAA to Aa1 due to its expectation that growth “will remain sluggish over the next few years”2. Then in April, the new Governor of England’s central bank, the Bank of England, Mark Carney, described the UK as one of the world’s “crisis economies”3, alongside Japan and Europe. In mid July, a report from the International Monetary Fund (IMF) said austerity measures designed to reduce government debt and weak demand for UK products and services meant “economic growth in the UK continues to be slow and fragile” 4. However, recovery is likely to be slow, Mr Dowie says. “The basic problem facing the UK economy is that inflation is averaging around 2.9% but wages growth is only 1.5%. Consequently, people are finding with increasingly difficult to pay their mortgages and are reluctant to spend,” he says. For investors in international managed investments, which include most super fund investors, the sharemarket has largely shrugged off problems in the economy. In fact, positive sentiment has helped drive buoyant sharemarket returns. 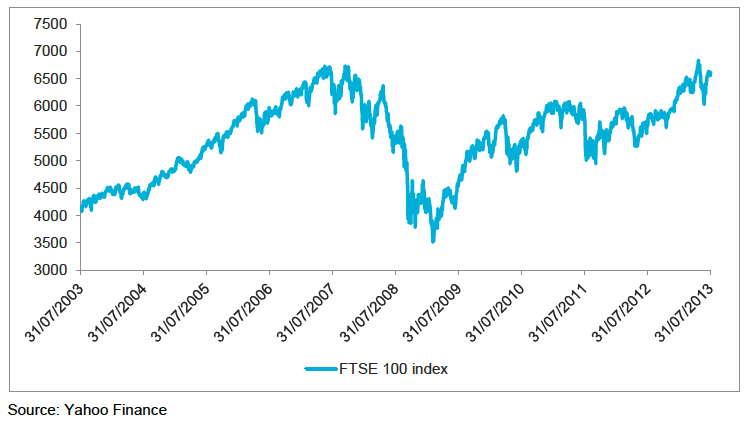 The most widely used gauge of the UK sharemarket, the FTSE 100 Index, rose 16.8% in the year to 31 July 2013 (in British pounds). As you can see from Chart 2, the sharemarket finished July just 2% below its 10 year high recorded in June 2007 and only 4% short of its all time high recorded on the last trading day of the 20th century, 30 December 19995. Returns have also been bolstered by the falling Australian dollar. In the year to 31 July 2013, the Australian dollar fell from about 67 British pence to 57 British pence. 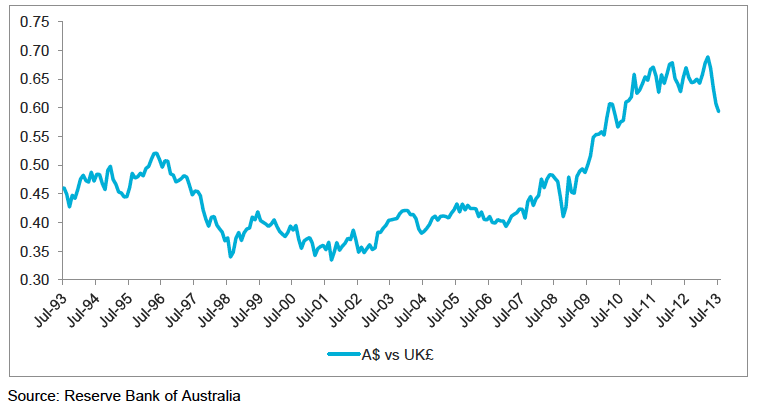 That roughly translates to an extra 11% return for Australian investors in UK shares. However, as you can see from Chart 2, while the Australian dollar has fallen in recent months, it is still well above its average level of the past 20 years. Another piece of good news, particularly for the thousands of UK migrants in Australia still owning property in the UK, is the signs of recovery in the UK residential property market. According to UK building society Nationwide, house prices rose around 4% in the first seven months of this year to their highest levels in five years. The growth has been particularly strong in London, where the average house price is now 5% higher than before the GFC in 2007. While there is plenty to celebrate about the UK at the moment, from both a sporting and economic sense, Mr Dowie says it is important to remember that the economic situation remains fragile and that gains in recent years can reverse quickly. Of course, before making a decision on whether to act on your UK investments, it makes sense to seek advice from a professional financial planner who understands your overall situation and your goals. The above information provides an overview or summary only and it should not be considered a comprehensive statement on any matter or relied upon as such. The information does not take into account your personal objectives, financial situation or needs and so you should consider its appropriateness having regard to these factors before acting on it. Please note that Andrew Dowie is employed by BT Financial Group.